The wonder computer of the 1980s. The VIC-20 from Commodore, world’s leading manufacturer of a full range of desktop computers. See the VIC-20 at your local Commodore dealer and selected stores. My first computer! I tricked mine out with a cassette tape drive (which actually worked reliably) and a 4k RAM upgrade, giving a luxurious 7.5K available! Learned a lot on that computer. The hidden advantage of that computer was the 23-column color screen. Given the vagaries of NTSC television, and the limited available RAM, that was the most information they could squeeze onto a color screen and still leave it readable. This meant that each individual letter was HUGE. Even after newer, faster computers became available, the VIC still had value for the visually impaired. I sold mine to the parents of a little girl with severe vision problems. They hooked it up to a 25″ TV so she could learn to read. Selling it to them made me happy (and made me $50). Also my first computer. Ahh, the memories. Radar Rat Race, anyone? First computer here, too. My uncle gave us birthday money to buy an Atari, but my mom was set against the idea. 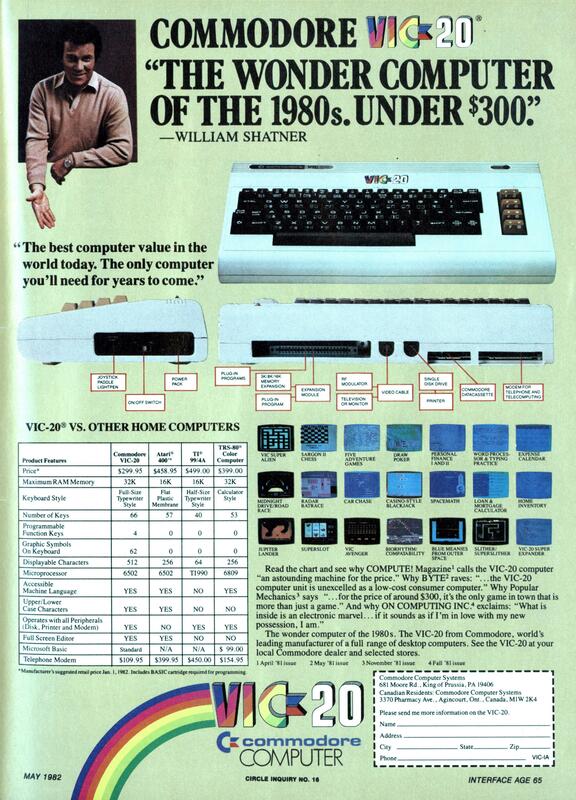 My older brother negotiated for a VIC-20, which had helpful photos of spreadsheets and word processing on the box. It must have been suspicious that the first “program” we bought was a Gorf cartridge, though. It was already well under $200 when we bought it at Target, but I could have sworn that was still 1982. Would it have been so steeply discounted already? I’m calling out the line on “Microsoft Basic” being “standard” on the VIC-20 and “$99.00” on the TRS-80 Color Computer. AFAIK, the Color Computer always came with “Microsoft Color BASIC”; later upgrades were “Microsoft Extended Color BASIC” and “Microsoft Disk Extended Color BASIC”. It was stored in ROM and was the first thing to come up when you powered it on. For the VIC-20, did it have commands like SET, RESET, COLOR, etc for graphics? I was always under the impression that to do anything interesting graphics-wise on the VIC or the C64, there was a lot of POKE’ing one had to do. On the Color Computer, it was always easy to do graphics under BASIC (and Disk Extended Color Basic added a ton of commands for “high-resolution” access). I’m pretty sure everything else in that chart is/was correct (not sure on prices, but they sound right). Note that the keyboard on the Color Computer eventually became something more “proper”, but that was more than a few years away…heh. Andrew: Agreed on the lack of direct graphics support in BASIC on the VIC-20. Changing any colors or character styles required POKEing, and I didn’t run across any “high-resolution” anything until I started using C64s years later. Ah, memories, I started with the Commodore 64 but still, brings a smile to my face. I too started with the C=64, then the Commodore 128, then the Amiga 500, 2500, and 3000. I still have the Amigas (in storage). My favorites for the 64 were the Zork series. @Chris Radcliff: Thank you for confirming my sanity. I should’ve mentioned that those graphics commands I posted, which were a part of the Microsoft BASIC on the Color Computer – were fairly standard across Microsoft’s BASIC interpreters (and later compilers); later versions (notably QBasic 1.1, QuickBASIC 4.5, PDS 7.1, and VB) all used a similar variation (PSET, PRESET, etc). Now – perhaps the VIC-20 had an older version of Microsoft BASIC (ie – it didn’t have those graphics commands)? I wonder what the truth is…? I’m just pretty certain that the Color Computer always came with Microsoft BASIC; that it wasn’t an optional $99.00 “upgrade”. 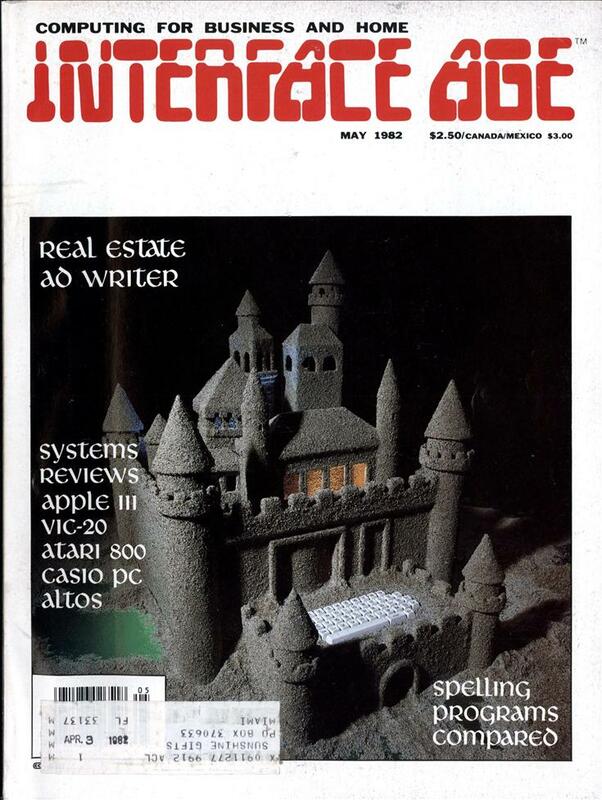 @Tim: Zork was cool on any platform – I had a copy on my CoCo at the time, later I played it on the Apple IIe, I think I had a copy on my Amigas, definitely on the PC, too – and I also have a copy currently on my G1 (well, it actually is a copy of Adventure running on an Apple IIe emulator – heh). My first computer too, did newsletters and word processing on it. Loved it. It was stolen from my office and I replaced it with a Kaypro II. Still have the Kaypro. 1. The CoCo came with Microsoft Color Basic. The $99.00 was for a ROM chip upgrade to “Microsoft Extended Color Basic”, which added commands for accessing high-resolution graphics, as well as other commands. 2. The VIC-20’s ROM has a string in it that reads “CBMBASIC” (ie; “Commodore Business Machines Basic”), according to one guy on the list. If the VIC-20 used Microsoft Basic – why would this string be in there…? @”Spooooock”: When did he ever stop (does “Travelocity” ring a bell)? @All: Another user on the Color Computer list I’m on noted that the BASIC that was used in Commodore’s machines was a version that was on a “pay once, no royalties” basis for $25,000.00 USD; sounds like it was an older version, and they couldn’t upgrade it (or couldn’t afford to?) to add the extra graphics commands…? There was a Super Expander for VIC-20, which added some commands for graphics and a whopping 3k of RAM. I have a impression, that it wasn’t very common.